Mission Report January 2016 – Nigeria Shall Flourish Again! “Nigeria shall flourish again!” so goes the motto of the new breed of Nigerians who are beginning to rise in power in the nation. Largely spearheaded by the pastor-prophet-attorney-politician Dr. Tunde Bakare. 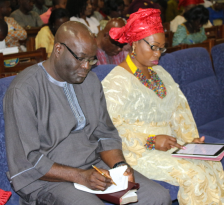 Dr. Bakare has dedicated most of his life to speaking boldly from the public platform that God has granted him through his church, television ministry, and campaigns. Additionally, he has invested his life in working behind the scenes to mentor young men and ladies – instilling in them the national vision, godly morals, and the uncompromising audacity necessary to step into become change agents in the nation. Furthermore, God has granted him inroads into the personal lives of men in the highest positions of leadership in every sector of the nation – including not only the church, but also the political, finance, and business arenas. One aspect of his efforts to impact the nation is an annual week of teaching that draws together leaders from all these varied sectors for intensive instruction on biblical leadership principles. The label given to this annual event clearly defines the meeting’s nature and purpose: CLASSIIIC – Christian Leadership Strategic Servanthood Intensive Interactive Interdenominational Course. It has been my privilege to be part of this intensive leadership meeting for the past several years, and I have suggested that we add one more “I” to the title for “Intimidating.” Truly it is a daunting task to speak into the lives of those men and women whose choices and influence will shape the destiny of their nation. When the recently elected president of Nigeria was invited to come to the White House for a meeting with President Obama, Dr. Barake was invited to travel with him as part of his political entourage. One of the things that Mr. Obama emphasized in the meeting was that he feels that as Nigeria goes so will the rest of Africa. With Nigeria poised to soon become the third most populous nation in the world and Lagos to become the most populated city on the planet, it is reasonable to think that President Obama’s comments are actually shortsighted. Certainly, Nigeria will set the pace and raise a standard for other African nations, but we must not limit it there. Nigeria will undoubtedly become a global influence and pattern. Dr. Bakare and all the leaders he is training up are determined that Nigeria will go the way of righteousness as a new breed without greed rises to position and prominence. In fact, during my visit in Nigeria, it was announced that Dr. Bakare had been invited to chair a new administration that will legally require transparency for every public official – making all their finances and all the funds they have access to and control over public record – a complete turn-around in a world where corruption and bribery are an accepted way of life. In this year’s CLASSIIIC, we had the privilege of helping to train more than six hundred fifty delegates and gave each one a free copy of my latest book, Positioned for Blessing and Power, a study on how to spiritually prepare themselves for the position of influence that God has destined for them in their nation, in Africa, and in the world!